The CBD or Central Business District is the focal point of a city. It is the commercial, office, retail, and cultural center of the city and usually is the center point for transportation networks. The CBD developed as the market square in ancient cities. On market days, farmers, merchants, and consumers would gather in the center of the city to exchange, buy, and sell goods. This ancient market is the forerunner to the CBD. As cities grew and developed, CBDs became a fixed location where retail and commerce took place. The CBD is typically at or near the oldest part of the city and is often near a major transportation route that provided the site for the city's location, such as a river, railroad, or highway. Over time, the CBD developed into a center of finance and control or government as well as office space. In the early 1900s, European and American cities had CBDs that featured primarily retail and commercial cores. In the mid-20th century, the CBD expanded to include office space and commercial businesses while retail took a back seat. The growth of the skyscraper occurred in CBDs, making them more and more dense. By the beginning of the 21st century, the CBD had become a diverse region of the metropolitan area and included residential, retail, commercial, universities, entertainment, government, financial institutions, medical centers, and culture. The experts of the city are often located at workplaces or institutions in the CBD—lawyers, doctors, academics, government officials and bureaucrats, entertainers, directors, and financiers. In recent decades, the combination of gentrification (residential expansion) and development of shopping malls as entertainment centers have given the CBD new life. One can now find, in addition to housing, mega-malls, theaters, museums, and stadiums. 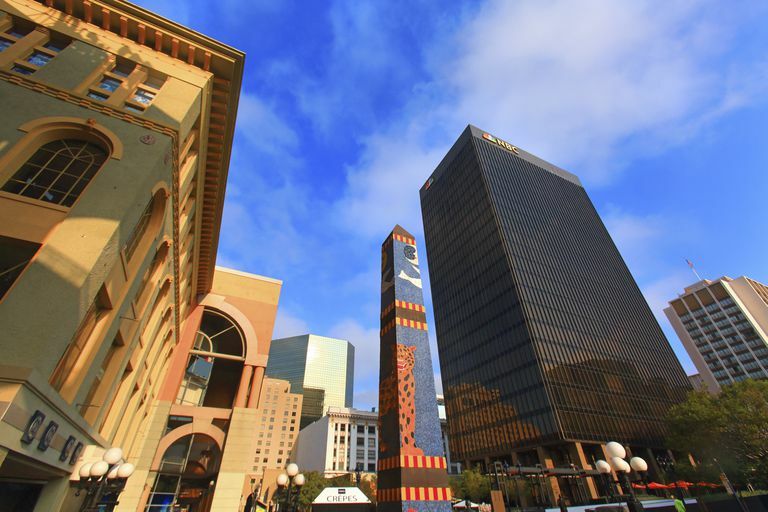 San Diego's Horton Plaza is an example of redeveloping the downtown as an entertainment and shopping district. Pedestrian malls are also common today in CBDs in an effort to make the CBD a 24 hour a day destination for not only those who work in the CBD but also to bring in people to live and to play in the CBD. Without entertainment and cultural opportunities, the CBD is often far more populated during the day than at night, as relatively few workers live in the CBD and most commute. The CBD is home to the Peak Land Value Intersection in the city. The Peak Land Value Intersection is the intersection with the most valuable real estate in the city. This intersection is the core of the CBD and thus the core of the metropolitan area. One would not typically find a vacant lot at the Peak Land Value Intersection but instead one would typically find one of the city's tallest and most valuable skyscrapers. The CBD is often the center of a metropolitan area's transportation system. Public transit, as well as highways, converge on the CBD, making it very accessible to those who live throughout the metropolitan area. On the other hand, the convergence of road networks in the CBD often creates overwhelming traffic jams as commuters from the suburbs attempt to converge on the CBD in the morning and return home at the end of the workday. 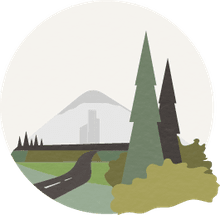 In recent decades, edge cities have begun to develop as suburban CBDs in major metropolitan areas. In some instances, these edge cities have become a larger magnet to the metropolitan area than the original CBD. There are no boundaries to the CBD. The CBD is essentially about perception. It is usually the "postcard image" one has of a particular city. There have been various attempts at delineating the boundaries of the CBD but, for the most part, one can visually or instinctively know when the CBD starts and ends as it is the core and contains a plethora of tall buildings, high density, a lack of parking, transportation nodes, a large number of pedestrians on the street and generally just a lot of activity during the daytime. The bottom line is that the CBD is what people think of when they think of a city's downtown area.